Use this simple feature to see attendees and set limits on how many signups are allowed for each event. 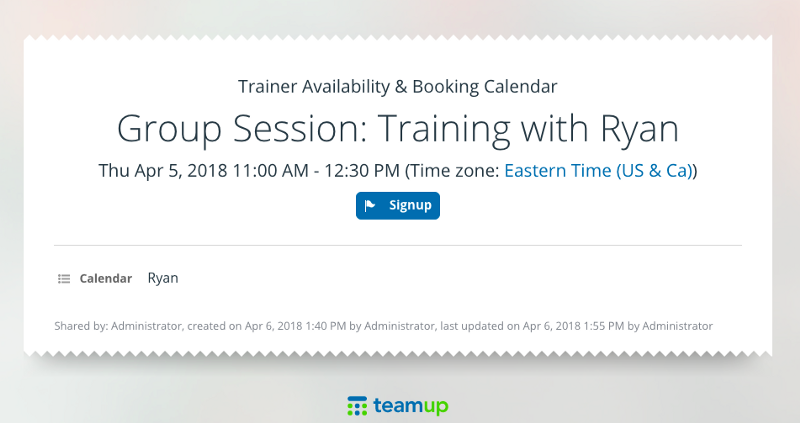 The signup feature in Teamup allows you to add a sign-up option to single events. You can enable it on any event and set a limit on the number of signups available. Or you can allow unlimited signups for a single event. To enable sign-ups on an event, open the event and choose the Options button. If you don’t see Signup on the drop-down menu, check your permissions. You can only enable signups if you are the administrator or have modifying permission to the event. It’s a quick and easy process to enable signups on your event. 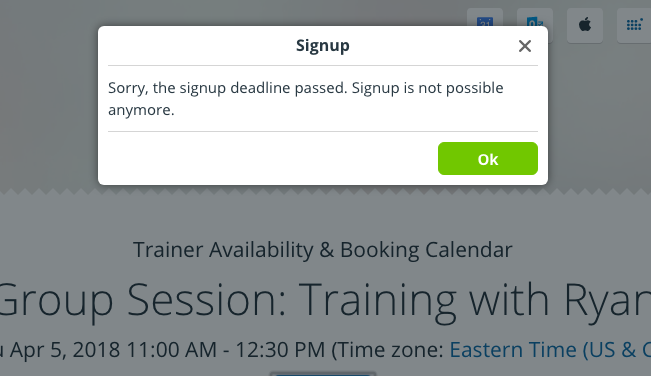 Then on the pop-up, enable event signup. When an individual clicks the signup, they will be prompted to enter their name and email address. You can choose to set a signup deadline. You can set a limit on the number of signups, if desired. You can allow the list of signups to be visible to users with modify permission or to all users. If you make the signup list visible to all users, email addresses are automatically masked to protect privacy. Once you’ve set the options you want, click the Done button, then click Save on the event. 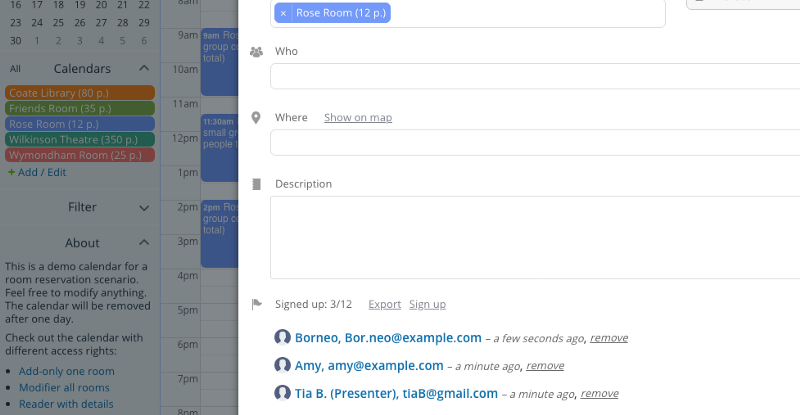 The Signup button will appear on your event once signups are enabled. You can also share the event. The signup button makes it easy for individuals to sign themselves up for your event. Here’s an event, with signup enabled, shared as a webpage. The message that shows when the signup deadline has passed. Anyone who provides coaching, consulting, or training sessions can benefit from the signup feature. Use your calendar to show your available coaching times. For each open time, enable signups. You can limit the signups to one, if you want to schedule an individual session. Or set it to the maximum number you want to have in a group coaching session. 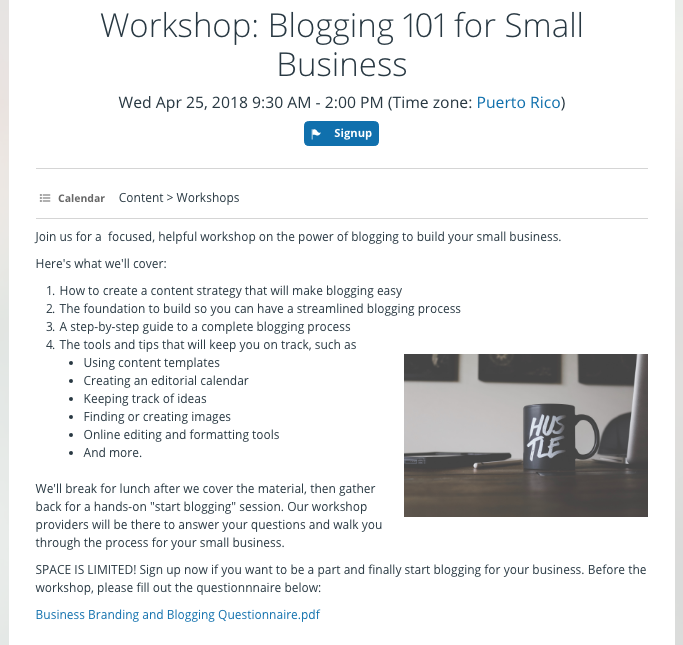 Then share the event (or the calendar itself, using a customized sharing link) with your list of clients, and they can signup to the session that works best. Educational workshops, seminars, and even webinars can be simplified with a signup option. You can share all the details of the event, such as the location and map. You can also upload materials you might want participants to have on-hand for the workshop. Then enable signups for the number of participants you’d like to allow. Participants can sign up and access materials from the event page. Conferences and trade shows often host smaller, “break-out” sessions for a limited number of people. You can let your speakers and presenters use signups for smaller, specialized workshops or sessions, so they can see how many people will attend and be better prepared. You can also set up a calendar for various conference spaces, such as individual meeting rooms, presentation rooms, and more. 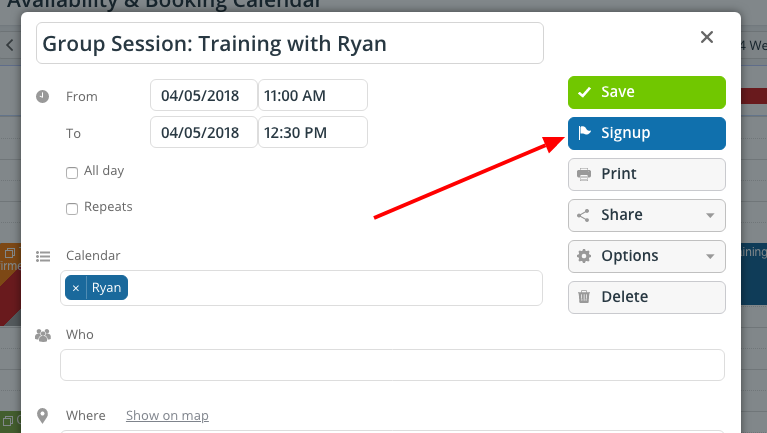 Use the calendar to schedule available time slots for each space, then enable signups to allow presenters or groups to claim the space for a particular time slot. As people signup, you’ll see the list of attendees on the event. 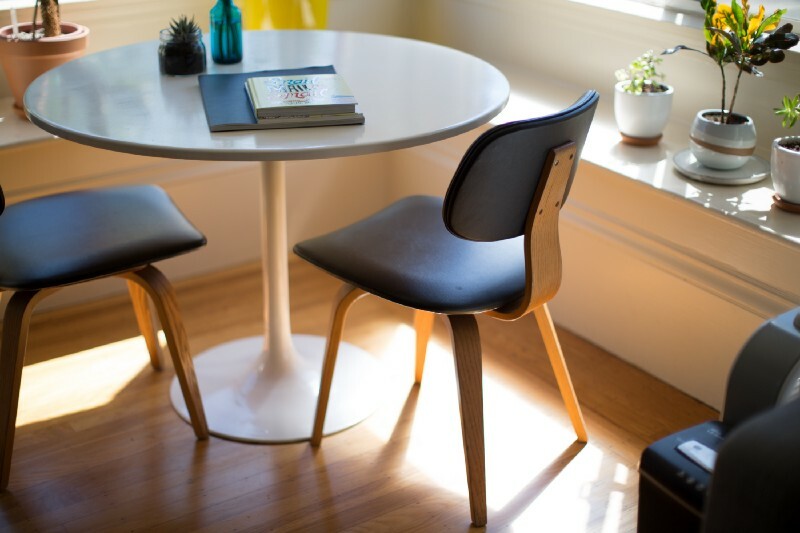 Other shared spaces, such as workshop areas, study rooms at a library, or party rooms at a community center, could be managed with signups, as well. It’s just a matter of creating a calendar, creating an event for the available time, enabling signups, and sharing the event with interested people. Other invitation-only events, whether personal, educational, social, or work-related, can be better managed with a signup option. Having a signup option allows the organizer to see who’s planning to attend, as well as limit the number of attendees if needed. Keep in mind that you can also use a signup option for virtual, online events. Hosting a webinar? You can share the webinar event as a webpage with signups enabled. Not only does signing up help people remember the event and actually attend, it also helps you plan better when you see the number of interested responses. How could you use the signup option in your calendar to make your next event event better? Header image by Nirzar Pangarkar on Unsplash.